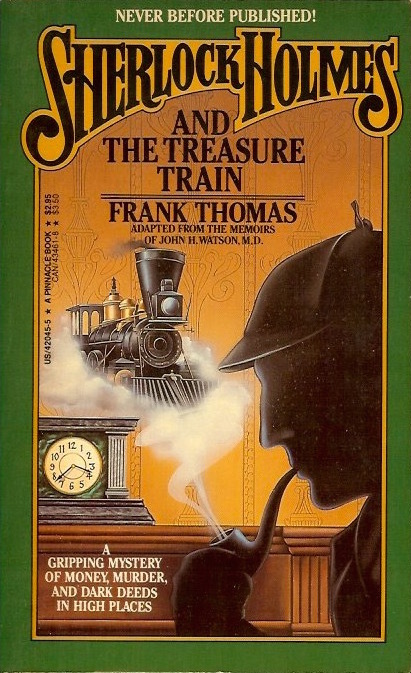 One of several original Holmes novels by Frank Thomas. This one has Sherlock solving a great train robbery. A half million pounds in gold has disappeared from an armored train outside London. The railroad and the banks are in an uproar, and finally they must turn to Sherlock Holmes for help. What begins as a deceptively simple case transforms into a puzzle unlike any Dr. Watson has ever seen, as Holmes works brilliantly to unravel an international tangle of high finance, low cunning, and cold-blooded murder. The clues are slim, the work is deadly dangerous, the game's afoot––and the great sleuth is giving chase!